Outrage for vegetarians and vegans over new £5 notes! The new plastic £5 notes which came into circulation in September have been found to contain tallow, an animal fat, much to the disgust of many vegetarians and vegans. When this was confirmed by the Bank of England, in response to question on Twitter, a petition was launched in protest. At the time of writing, this has attracted over 70,000 signatures but the Bank of England has yet to comment on it. It has been pointed out that not only vegetarians and vegans but also some religious groups and environmental groups (like us!) 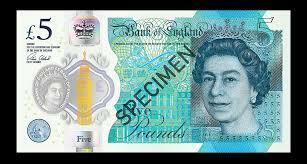 who are likely to take issue with the new £5 including animal fat. As an alternative some creative thinkers have asked for the new £5 notes to include fruit and vegetable pulp so we can get our ‘fiver a day’! The animal fat found in the new £5 notes has also sparked discussion about the many other commonly used products which contain traces of animal fat. These include toothpaste, candles and bicycle tires. This is a reminder to us all about being aware of the use of animal fat and trying to do what we can to avoid it where possible. Plant based alternatives to these products are available but cost more to produce so the animal fat variety are probably more commonly used in order to save money. Our new money is being printed in a money saving way! Let’s try and use plant based alternatives to animal fat whenever we can.